Shopping for a new Kia Optima? Although the Optima offers three different engines, we’d only recommend two. Stick with the base 2.4-liter inline-4 or 2.0-liter turbo-4—the middle child is worth forgetting in this instance. The 2018 Kia Optima is a mid-size sedan and proof that the talent pool for value-packed four-doors isn't yet dry. This year's sportier trim and common-sense safety features that help it nearly ace our safety test may get lost on buyers who are racing toward crossovers. Slow down and look at sedans like the Optima, we'd say. 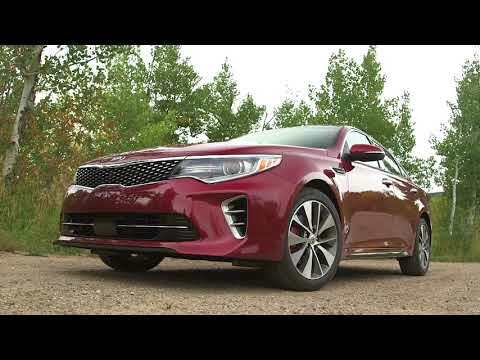 Take a walk around a Kia lot and you’re likely to find the usual suspects for the Optima—a budget-friendly Optima LX that starts at $23,395, including destination, all the way to the fully loaded Optima SX for $31,395. Wedged in the middle for this year is a new Optima S trim that adds a sportier look: a new front bumper, rear decklid spoiler, 17-inch wheels, and a dual-pane sunroof for $24,395. Across all models this year, blind-spot monitors with rear cross-traffic alert and rear parking assistance are now standard, which shore up some of our concerns that active safety features were being kept from all but the most expensive models. A relatively large number of powertrain options await Optima shoppers, not including Optima Hybrid models that we cover separately. Up and down the range, the 2018 Kia Optima is powered by a bevy of inline-4 options, including some turbocharged options. 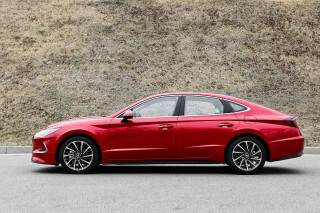 The base 2.4-liter inline-4 is found on Optima LX and the new S trim level, a 1.4-liter turbo-4 is optional on the LX trim, and a 2.0-liter turbo-4 is found on pricier SX trims. 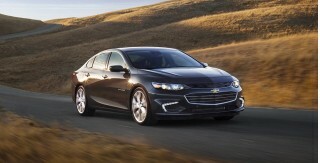 All models are front-wheel drive and manage combined fuel economy at 25 mpg or higher. All models benefit from a good ride and handling setup, which makes the Optima comfortable, if not particularly sporty. Every trim of the 2018 Kia Optima is handsome, which means even base models are good value when it comes to looks. The 2018 Kia Optima hasn’t changed since it was new for 2016, and the roots for that car go back further to 2011 when it fundamentally shifted how we look at mid-size sedans. From the outside, the Kia Optima embodies the latest and greatest in mid-size moves over the last decade. Its shapelier and curvier body starts at its coupe-like roofline that descends gradually enough to gift rear-seat riders with enough head room. The overall proportions are elongated just enough to give the front-drive Optima a sportier, rear-drive profile that the new Kia Stinger (which is actually rear-drive) earns and improves upon. Every competitor has adopted similar dimensions, which means that the Optima isn’t as revolutionary as it once was. Inside, the Optima pushes its dash further forward and into the corners, which improves outward visibility. The cockpit isn’t as driver-focused as last iterations, but the fit and finish makes up for those shortcomings. The Optima’s luxury-influenced details are a marked improvement over last-generation sedans, befitting Kia’s rise as a more premium brand. We like the inside look, particularly in top trim levels, such as the Optima SX. One nitpick: We’d probably delete the “Turbo” badges found on the front fender portholes near the rear doors on SX trims. We’d like that word to return to its 1985-pinnacle of popularity, but for now it seems a little gratuitous. Quiet and composed, the 2018 Kia Optima has good table manners, but it’s not too spicy. The 2018 Kia Optima’s chief appeal will be its ride quality and competent handling—as it should be for a mid-size sedan. Let’s talk numbers. 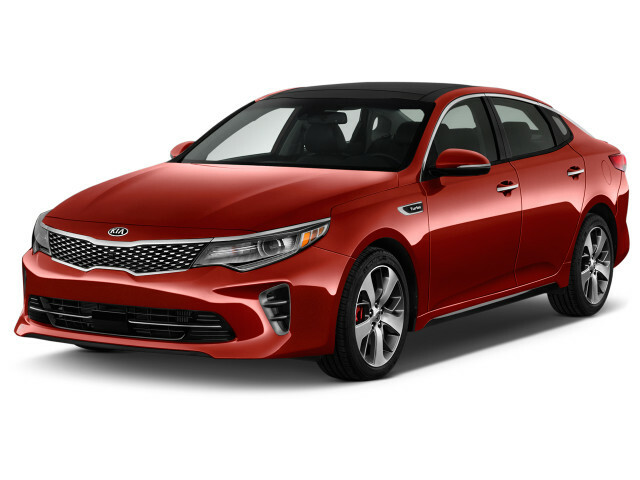 Base Optima LX, Optima EX, and Optima S sedans and will be fitted with a 185-horsepower, 2.4-liter inline-4 that uses direct injection to maximize fuel economy. That’s fitted to a 6-speed automatic that needs convincing to bring the busy 2.4-liter inline-4 into its sweet-spot for passing power. 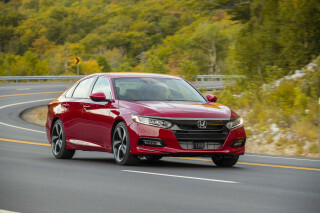 Its peak torque output happens at 4,000 rpm, which is lower than the top turbocharged offerings, so kicking down a couple gears to pass is the name of the game on steep mountain inclines. We’ve found in our drives that the base 2.4-liter inline-4 is smooth and should be adequate for most buyers’ needs, provided that need isn’t outright speed. An optional 1.6-liter turbo-4 is found in LX models that makes 178 hp and 195 lb-ft of torque and is mated to a 7-speed dual-clutch automatic. Its trick is efficiency, although it’s hardly a pokey engine. It feels more responsive than the 2.4-liter inline-4, but we’ve found that it’s somewhat hamstrung by a indecisive 7-speed dual-clutch that clobbers through gears compared to similar units made by Volkswagen or Ford. The 1.6-liter turbo-4 is how the Optima manages combined fuel economy over 30 mpg, although every model is fuel-efficient for its class. The 2.0-liter turbo-4 found in SX models are the most fun to drive. Mated to a 6-speed automatic, the 2.0-liter turbo-4 makes 245 hp and 260 lb-ft and comes on strong lower in the rev range (just 1,350 rpm). The top-end engine reads your right foot well; downshifts come quickly and paddle-shifters give drivers granular control over what gear to use and when to use it. More sound-deadening in SX models quells the 2.0-liter’s harsher vibrations, which we appreciate. The 2018 Kia Optima is a smooth mover with revised suspension bits from previous generations. The Optima retains a familiar MacPherson front strut and multi-link rear setup, although revised front bushings and cushier springs damps fussy pavement. The trade-off is a little more body lean, which isn’t uncouth for its class. The Optima irons out the road in return for a tippier cornering character—we think flat and fast will be the upcoming Stinger’s purview anyway. All models come with selectable drive modes that toggle the throttle response and transmission behavior among Eco, Normal, and Sport modes. We’ve found the Normal mode to be the goldilocks zone for most circumstances; Sport can be too hot, Eco can be too cold. This year, all trims of the Optima adopt a steering system that we prefer over an older setup, thanks to its sharper feel when the roads get curvy. The 2018 Kia Optima should be on the short list for many buyers looking for a comfortable mid-sizer. The 2018 Kia Optima is evidence of the automaker’s move upmarket. Its confines are roomy and well-appointed, and its fit and finish is punching above its weight class, even in base trims. Top-trim SX models get swathes of sound-deadening material, but all trims of the Kia Optima are quiet inside. 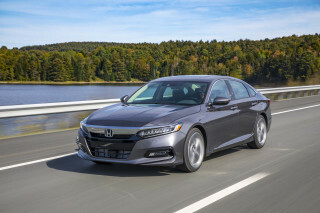 The front windows, dash, windshield, and body panels have gotten special attention by sound designers to quell any thrums from the inline-4 engines, and with good effect—the doors close with a reassuring “thunk” reserved for luxury vehicles. Up front, the seats are lower and deeply bolstered with good side support and room for long legs. Most models will have power-adjustable front seats, which adapt to a wide-ranging set of body types. Some models will feature diamond-patterned seating that’s normally reserved for a higher tax bracket, and we appreciate Kia’s efforts there. If we’re going to knock the Optima, we’ll do it in rear-seat head room. The aggressively sloping roofline makes a styling promise that rear passengers will have to make good on; there’s just enough head room for 6-footers, but not much more. Wide rear doors make entry and exit easier for most of us, however. The trunk swallows 15.9 cubes of cargo, which is on-par for its class, and the rear seats fold down in a 60/40-split when more flexibility is necessary. Ergonomically, the 2018 Kia Optima cleans up well and features easy-to-understand dials and buttons for most tasks, including a simple infotainment interface that we think will be easy for even our parents. Base LX models don’t feel particularly cheap either, which we can't say about some of the other mid-size competitors. The Optima resolves our gripe from last year with wider available safety features, and its crash-test scores are flawless. 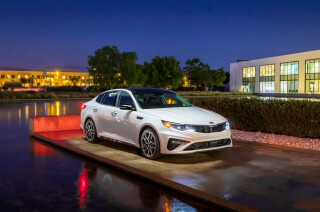 The IIHS gave the Kia Optima a “Top Safety Pick” award thanks to its top “Good” scores on all crash tests and for its headlight performance—one of the few cars to ace all its tests. 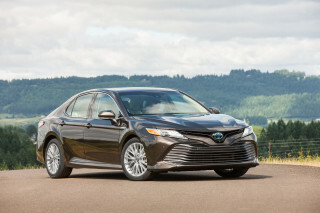 In addition to top marks from independent testers, federal regulators gave the Optima across-the-board five-star ratings for crash safety, including a five-star overall rating. A rearview camera is standard on all models, and for 2018, so are blind-spot monitors with rear cross-traffic assist, and rear parking assistance. Standard equipment on all Optimas includes seat-mounted side airbags, side-curtain airbags, a driver’s knee bag, front active headrests, electronic stability control, and hill-start assist, to keep the vehicle from rolling back when starting on a steep uphill grade. Automatic emergency braking is available now on more models, which was our only gripe from last year. Other automakers are making it standard on all models, something we wish Kia would consider, but wider availability is a good first step. All versions of the 2018 Kia Optima are equipped with a standard complement of airbags, including seat-mounted side airbags, side-curtain airbags, and a driver’s knee bag. The Optima also includes stability and traction control systems. No Kia Optima feels cheap, and top trims are a good value for its class. The 2018 Kia Optima can be as frugal or as opulent as your budget will allow, but no model is bare. Kia offers the Optima in LX, S, EX, and SX trims, starting at $23,395. 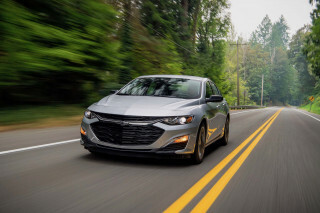 Base models feature keyless ignition, Bluetooth connectivity, power-adjustable front seats, a rearview camera, 16-inch wheels, and a 7.0-inch touchscreen for infotainment with Apple CarPlay and Android Auto compatibility. The Kia Optima can climb the ladder of creature comforts quickly, but no models are particularly high-priced. 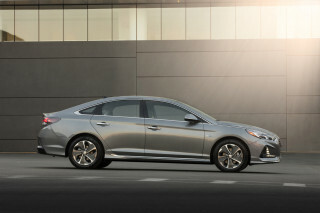 The new S trim, which Kia says is a sportier take on the Optima sedan, still retains the base 2.4-liter inline-4, but adds 17-inch wheels (18-inchers are available), unique front bumper and rear spoiler, 10-way power adjustable driver’s seat and optional dual-panel sunroof. EX models are equipped similarly but add standard leather seats, heated front seats, dual-zone climate control, available active safety features (which we cover separately) and a woodgrain trim that’s a little more upmarket than the base dash. 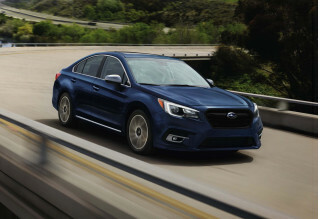 SX models go the whole nine with 18-inch wheels, an upgraded 8.0-inch touchscreen, a bigger driver information cluster, dual chrome exhaust tips, glossy black trim, air conditioned front seats, keyless ignition, and adaptive headlights. More options are reserved for higher trim levels, which we wish Kia would reconsider. Although we’d note that the top trim for the Kia Optima still hovers around $30,000, which is reasonable for the class and relatively good value. The 2018 Kia Optima isn’t as fuel efficient as some of its competitors, but 25-mpg combined or better isn’t bad. Kia was one of the first automakers to adopt a lineup of all 4-cylinder engines for their mid-size sedan. Others are following suit. Some competitors will manage better fuel economy than the Kia Optima, although Kia is still within arm’s length of those models. More efficient 1.6-liter models will get the best ratings of the lineup (without opting for the hybrid versions, which we cover separately) at 28/37/31 mpg. Top-trim editions of the Kia Optima get a 2.0-liter turbo-4 that manages 22/31/25 mpg, according to the EPA. We think you might be able to get better returns in the real-world with a light foot. It’s worth noting that all versions of the Optima are rated for regular unleaded, which can save pennies at the pump.